Jack Nicklaus was on to something when he discovered a truth about himself as a very young golfer – and used this fundamental knowledge his entire career. 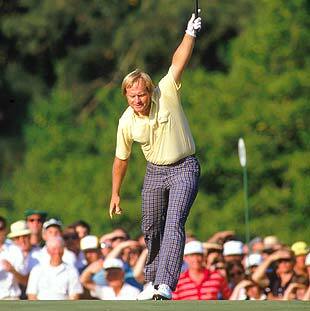 Jack was known as a powerful golfer. A big, strong, somewhat thick, burly guy who could pummel the ball in ways unlike anyone in the game was doing when he arrived on the tour in the early 1960s. Nicklaus learned how to calm himself– to tap into an inner calm and inner peace so that he could stay in the game – neither too excited nor too upset/frustrated. He taught himself to – as Moe Norman might have said it – take an alert attitude of indifference into his play. And this made a tremendous difference in allowing him to play so well in clutch moments. Clearly his shot-making abilities were incredible. ( Great skills are a non-negotiable…so keep working on the model!) But his commitment to staying calm was also a HUGE part of his success. His mental game success formula was so simple. So accessible to everyone. Not that hard. It just takes some awareness, intentionality and commitment in order to see your world in more productive way and to interpreting the events that occur in your environment – more objectively. You may not be able to bomb it down the fairway like Jack Nicklaus did. (Or today’s equivalent – Brooks Koepka, Justin Thomas, Bubba Watson, Xander Schauffele…etc) But you CAN achieve the same level of calmness and mental skill that Jack realized… with some practice and attention. Tuning in to your own confidence level in any moment. Recognizing that your feelings – fear, anxiousness, nervousness – are products of your THINKING. Keep this in mind as you work on your game this winter. The most important opportunity in your game right now might not involve picking up your clubs, but rather, learning to cultivate a productive level of calm and inner-peace that you can take to the course. Paul Monahan, PCC is a Peak-Performance coach, member of the International Coach Federation and a certified COR.E Performance Dynamicsä Specialist. He resides in Cleveland, Ohio with his wife Paula and is the proud dad to three young men. I love reading your pieces on the mental side of golf and actually the mental side of life as they are the same. You are very insightful. Living from the inside out makes total sense and is empowering. I attended a five day build your game camp in Orlando. You were there as a presenter. Paul is incredible! He is actually down here for our March 1-3 School as well. Always great to get mental insight from him.